James Edward Buttersworth - "Volunteer"
During his career, James Edward Buttersworth developed a researched sense of what British and American collectors were looking for in terms of representational conventions of style and form. Herein lies one of the major reasons for his success as a maritime artist during his time and to this day. As a painter, Buttersworth was not so much interested in realism in his portrayals of ships but rather in producing works which were successful in attracting the collector’s eye and the wider public. 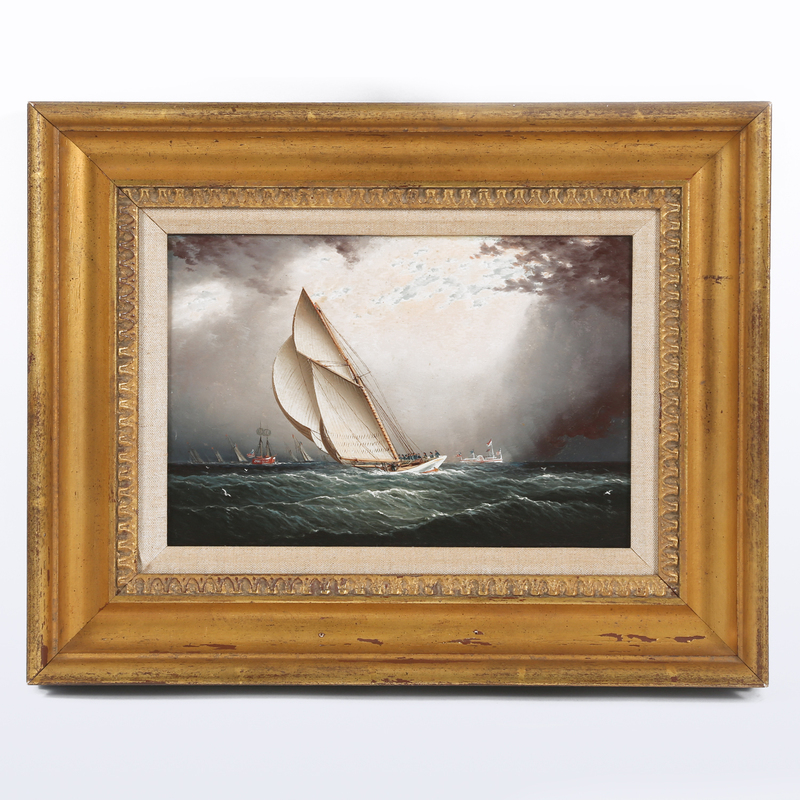 The sloop-yacht portrayed by James Edward Buttersworth offered in Lark Mason Associates’ British and American Sporting and Maritime Paintings and other Fine and Decorative Works of Art auction won the America’s Cup in 1887. 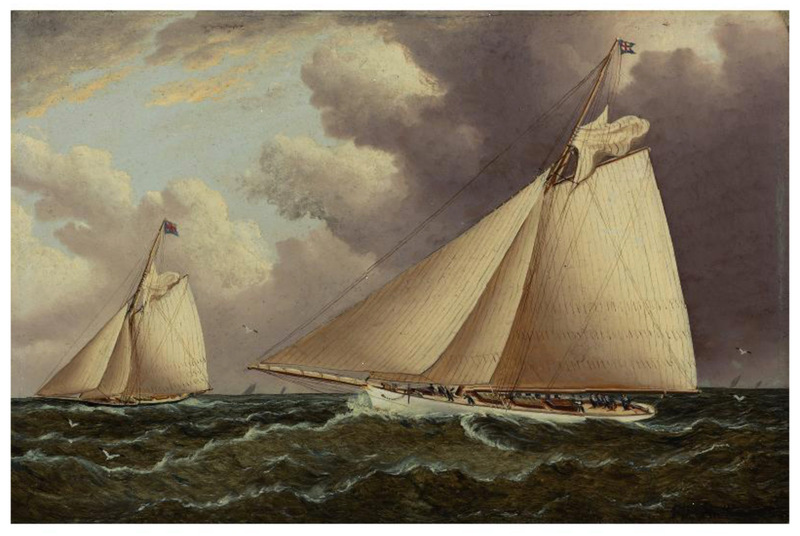 Buttersworth is known to have painted the yacht a great number of times and representations of it where the yacht is depicted by itself or among other yachts are in several private collections and a number of museums including The Museum of America and the Sea: Mystic Seaport located in Mystic, Connecticut and the Minnesota Marine Art Museum in Winona. The Volunteer was designed specifically to become a defender in the America’s Cup by General Paine, a Union Army general during the war and owner of the yacht, and Edward Burgess, a celebrated American yacht designer during the late 1800s. The 106 foot sloop-yacht was built in Delaware at Wilmington and rigged at Boston. It was steel hulled, had a centerboard which enabled its draft to intensify from ten feet to twenty-one feet. At its first competition in the Annual Cruise organized by the New York Yacht Club the Volunteer outpaced the well-known Mayflower. James Edward Buttersworth, Volunteer and Thistle, Oil on Board, 13 1/2 inches by 17 1/2 inches. Buttersworth’s painting of the Volunteer in our sale is not just a portrait, it is a depiction that speaks to the vision and expertise of the yacht’s designers, the glories of the yacht itself, and the winning teams who sailed it. One notable rivalry Buttersworth represented on a number of occasions was that of Volunteer against Thistle. Looking at the example featured above, the Volunteer wins ahead of the steel-hulled 108 foot Thistle. The superiority of the Volunteer is highlighted by its ability to sail closer to the wind than the Thistle, allowing it to defend the New York Yacht Club’s title and win the America’s Cup in 1887.